He played the organ in the Lutheran church and was an officer in Mountain Lodge No. 99 Masons.” (letter from Noel Speir Cook, 1-10-1988). Scharf [p. 1491] notes that Mr. Puder was an officer in the Mountain Lodge of A.F. and A.M., No. 99, in 1881. 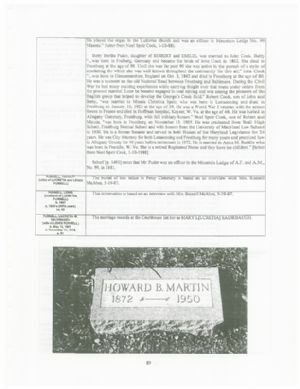 The burial of this infant in Percy Cemetery is based on an interview with Mrs. Russell McAbee, 5-19-1987. This information is based on an interview with Mrs. Russell McAbee, 5-19-1987. The marriage records at the Courthouse list her as MARY L[UCRETIA] SAURBAUGH.